a Male SB 323 was related to SB 181 (deceased), which also had only one descended testis and similar testicular hypoplasia. testis was consistently smaller than the left. After puberty, at about 7.5 years of age, the right testis decreased in size and atrophied with no evidence of trauma during the animal's lifetime. 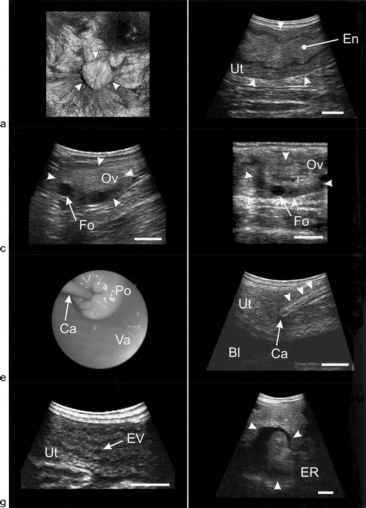 At the time of the survey, this captive-born male (produced from wild-born parents, male SB 183 and female SB 162) was 10.5 years old, and the right testis was small and adhered to the body wall near the inguinal canal (see Table 7.4). Similar to SB 323, SB 345 produced a high-quality ejaculate, suggesting that a single, normally descended testis probably compensates for compromised function in the contralateral gonad. Delayed testicular development and cryptorchidism can be a manifestation of reduced genetic variation and inbreeding. For example, in a small population of about 50 wild Florida panthers (Puma concolor coryi) in the southern USA, delayed testicular descent was documented in 23% of juveniles (Mansfield & Land, 2002). Cryptorchidism (one or more retained testes in the inguinal canal) was associated with incestuous matings and occurred in 56% of males (Roelke et al., 1993), compared to only 3.9% in other puma populations (Barone et al., 1994). Following genetic 'enhancement' of Florida panthers with Texas puma (Puma concolor stanleyana) introductions, there was a complete absence of cryptorchidism in all resulting progeny (Mansfield & Land, 2002), supporting a link between genetics and cryptorchidism in a carnivore. A low incidence (circa 2%) of unilateral cryptorchidism has been observed in wild American black bear populations (Mark Cunningham, pers. comm.). Unilateral cryptorchidism has also been reported in maned wolves and black-footed ferrets produced in captivity where the populations have originated from four and seven founders, respectively. Finally, cryptorchidism is known to be highly heritable in the dog and pig, with all affected males excluded from breeding programmes. Until this condition is better understood in the giant panda, we would not recommend breeding any male with testicular hypoplasia or atrophy.